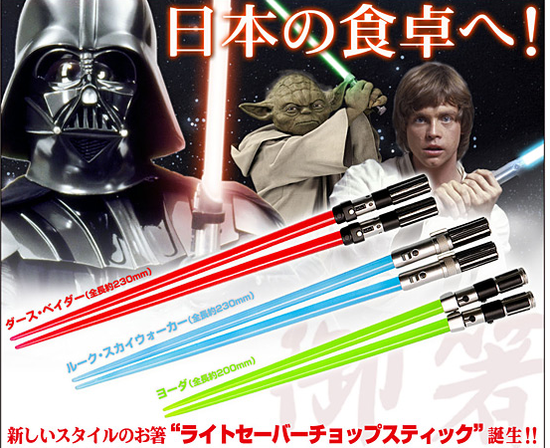 I saw an online ad for 「ライトセーバーチョップスティック」 (“Lightsaber Chopsticks“)! They come in red “Darth Vader” lightsaber, blue “Luke Skywalker” lightsaber, and green “Yoda” lightsaber. The red and blue ones are 230mm “adult size” and the green pair are 200mm “child size” chopsticks. The ad says 「日本の食卓へ！」 (“(Coming) to dinner tables in Japan!”). I’m not a big enough of a “Star Wars” fan to buy something like this. I prefer to use normal 箸 (chopsticks).